﻿ PORTWELL ANNOUNCES INTEL® BRASWELL-BASED COM EXPRESS MODULE FOR SCALABLE INNOVATIVE EMBEDDED SOLUTIONS- Portwell, Inc.
Portwell, Inc.,(http://www.portwell.com.tw) a world-leading innovator in the Industrial PC (IPC) market and a Premier member of the Intel® Internet of Things (IoT) Solutions Alliance today announces the release of PCOM-B636VG, a Type 6 COM Express Compact (95mm x 95mm) module based on the latest Intel® Celeron® and Pentium® processor N3000 product families (4W~10W), formerly codenamed Braswell. The new Intel Braswell architecture CPUs bring greater CPU and graphics performance over the previous generation entry-level CPUs from Intel while operating with lower power consumption and lower TDP. The four new CPUs, all based on the 14 nm manufacturing process unveiled by Intel, include the Celeron processor N3000, N3050, N3150, and the Pentium processor N3700. The PCOM-B636VG is designed to help customers who are currently using COM Express module solutions upgrade their systems without having to change existing carrier boards and operating systems. This helps boost system performance with prolonged service life for another 7 years, maximizing customers' return on investment. The compact PCOM-B636VG COM Express module supports up to 8GB (based on 8GB MDC, memory device chip) DDR3L 1333/1600 MT/s SDRAM on one 204-pin SODIMM socket, making it faster than its predecessor. Its expansion interface supports four (max.) PCI Express x1 Gen2 (5.0GT/s) for enhanced video performance and offers the flexibility to be configured to two x2 lanes or one x4 lane. In addition, it supports one high-resolution display, DP (DisplayPort) or HDMI selectable to double 3D performance compared to the previous generation. "When designing the PCOM-B636VG, we applied the successful modular computing concept of our COM Express form factor and came up with an even more compact, efficient and economical combination," says Frederic Wang, manager of Portwell, Inc. "The ultra low power Intel Celeron or Pentium processor is housed on the PCOM-B636VG module board. And in this way," Wang explains, "we were able to maximize Computer-On-Module (COM) technology to produce a unit that not only outputs under 4W~10W for fanless applications, but also supports almost double the performance of solutions based on previous generation Intel Pentium and Celeron processors, codenamed Bay Trail. Particularly, the Intel Celeron and Pentium processor N3000 families utilize the 8th generation Intel HD Graphics as its other siblings, but carries more-powerful graphics core due to its operating frequency. The normal operating frequency of the GPU is 400MHz making it 100MHz faster than even the Intel HD Graphics 5500." 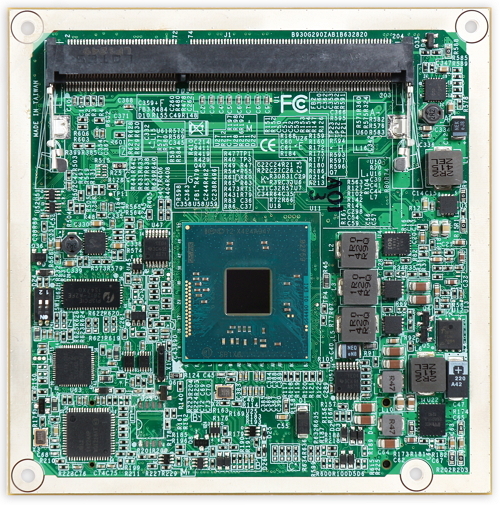 The PCOM-B636VG COM Express module has been enhanced by Portwell in response to market demand for an even lower power platform to take advantage of the latest Intel Celeron or Pentium processors' already compact design. Furthermore, Portwell's versatile COM Express modules adapt to the latest processor technologies by enabling designers to partition commodity host-processors from proprietary baseboards, thereby minimizing current and future design risks during the initial phase of development. This design, of separating the CPU-upgradable module from system specific I/O carrier boards, further safeguards development investments and lowers total cost of ownership. In addition, Portwell can also provide services to clients on the carrier board design and development, review schematics and BIOS customization. At Portwell, we strive to create superior products for our customers.